Highly attractive, sweetly fragrant summer flowering bulbs, in a stunning array of bright colours! Perfect for growing in pots on your patio or planting in beds or borders. They'll make incredible indoor cut flower displays! Supplied as a pack of 100 corms, size 4/5, in a mix of at least 6 colours and shades. Heat-treated to guarantee flowering this year. One of the most attractive and sweetly fragrant summer flowering bulbs, this specially selected mixture will be supplied as heat-treated corms, which guarantees they will flower from the first season onwards. Supplied in a stunning array of bright colours, these will be perfect for growing in pots on your patio or planting in beds or borders. They will over-winter in mild winters, and produce bigger and better displays in future years. These beauties no longer need to be simply a treat, so grow your own, and you can enjoy bountiful crops to pick again and again, and at a fraction of even supermarket prices and at just pennies per bulb. They thrive in pots in warm spots, or in well-drained soil, they will flower in summer. Cut the flowers when tight in bud for maximum enjoyment and fragrance indoors, or leave them to provide a splash of colour outside. Cut the flowers when tight in bud for maximum enjoyment and fragrance indoors or leave them to provide a splash of colour outside. 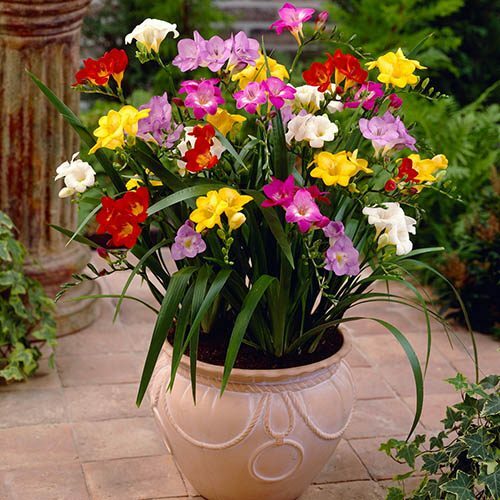 Freesias can be planted outside from April - May. Plant the corms straight into the ground, pointy end upwards, in a well-drained spot in sun or light shade. When the plants are up and growing, they will benefit from a potash-rich feed. Plant six bulbs, at 1-2 in deep. Use a good quality compost with a little extra grit for drainage.